Baldwin County Mathematics Pacing Guide Grade 1 Legal Authority for Course of Study §16-35-4 and §16-6B-2(f). The state board of education, on the recommendation of the state superintendent of education, shall prescribe the minimum contents of courses of study for all public, elementary and high schools in the state… Working Definition for Course of Study A course of study is a curriculum document containing academic content standards that specify what students should know and be able to do in a particular subject area by the end of each grade level course. 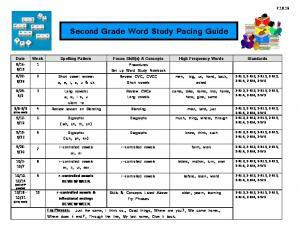 Pacing Guide A pacing guide is a schedule of when required content standards will be taught over the course of the school year. Pacing guides are developed to help teachers cover all course of study standards in a timely manner before the end of the academic year and/or high-state testing. Components The Baldwin County Pacing Guide includes these components: Standards, Resources/Materials, and Vocabulary. The Standards are taken directly from the Alabama Course of Study for each grade level and content area. The content standards describe what a student should know and be able to do by the end of a grade level course; the standards address what is fundamental to the content. The resources listed under Resources/Materials are a starting point for instruction; not a mandate limiting instructional materials. The Resources/Materials section reflects where lessons for particular standards are located in the textbook as well as other supplemental materials. The change from textbook-driven to standards-based instruction is an important shift in the teaching paradigm. Professional teacher judgment is a vital component for building resources beyond the textbook to meet the needs of all students. The Vocabulary component may include content as well as standards/test vocabulary. Vocabulary development is critical to academic success. It is important that students are exposed daily to new content vocabulary and standards-based vocabulary. Baldwin County Public Schools Elementary Mathematics Pacing Guide Year at a Glance Use with Houghton Mifflin Harcourt Go Math! Grade 1 *It is suggested that 1st grade use the Go Math! book in sequential order. 1.3 Hands On – Model Putting Together TE pg 21A 1.OA.1, CC.1.OA.1 Use concrete objects to solve “putting together” addition problems How do you model putting together? 1. add • iTools: Counters • HWH Mega Math MathBoard, two-color counters, Counting Tape, Graband-Go Centers Kit: orange activity card 3, Join Us, Games- Addition Bingo 1day 1.4 Problem Solving - Model Addition TE pg 25A 1.OA.1., CC.1.OA.1 Solve adding to and putting together situations using the strategy make a model. How do you solve addition problems by making a model? 2.4 Problem Solving – Model Subtraction TE pg 65A 1.OA.1, CC.1.OA.1 Solve taking from and taking apart subtraction problems using the strategy make a model. How do you solve subtraction problems by making a model? 3.1 Algebra -Add in Any Order TE pg 97A 1.OA.3, CC.1.OA.3 Understand and apply the Commutative Property of Addition for sums within 20. What happens if you change the order of the addends when you add? 3.6 Practice the Strategies TE pg 117A 1.OA.6, CC.1.OA.6 Use strategies to count on, doubles, doubles plus 1, and doubles minus 1 to practice addition facts within 20. What strategies can you use to solve addition fact problems? 3.7 Hands On- Add 10 and More TE pg 121A 1.OA.6, CC.1.OA.6 Use a ten frame to add 10 and an addend less than 10. How can you use a ten frame to add 10 and some more? 3.9 Use Make a 10 to Add TE pg 129A 1.OA.6, CC.1.OA.6 Use numbers to show how to use the make a ten strategy to add. How can you make a ten to help you add? 3.10 Hands On- Algebra- Add 3 numbers TE pg 133A 1.OA.3, CC.1.OA.3 Use the Associative Property of Addition to add three addends. How can you add three addends? • Animated Math Models • iTools • HMH Mega Math MathBoard, connecting cubes in three colors, Counting Tape, Grab-and Go Centers Kit: purple activity card 16, Game- Neighborhood Sums, Funny Bunny Hats 1 day 3.11Algebra- Add 3 numbers TE pg 137A 1.OA.3, CC.1.OA.3 Understand and apply the Associative Property or Commutative Property of Addition to add three addends. How can you group numbers to add three addends? • Animated Math Models • iTools • HMH Mega Math MathBoard, crayons, connecting cubes, Counting Tape, Grab-and-Go Centers Kit: : purple activity card 16, Game- Neighborhood Sums, Funny Bunny Hats 1 day 3.12 Problem Solving- Use Addition Strategies TE pg141A 1.OA.2, CC.1.OA.2 Solve adding to and putting together situations using the strategy draw a picture. How do you solve addition word problems by drawing a picture? 4.1 Count Back TE pg 153A 1.OA.5, CC.1.OA.5 Use count back 1, 2,or 3 as a strategy to subtract. How can you count back 1,2,or 3/ 1. count back • Animated Math Models • iTools • HMH Mega Math MathBoard, two- colored counters, Counting Tape, Math Club, Grab-and Go Centers Kit: orange activity card 5, Game- Under the Sea, Math Club 1 day 4.2 Hands On- Think Addition to Subtraction TE pg 157 A 1.OA.4, CC.1.OA.4 Recall addition facts to subtract numbers within 20. How can you use an addition fact to find the answer to a subtraction fact? 4.4 Hands On- Use 10 to Subtract TE pg165A 1.OA.6, CC.1.OA.6 Use make a 10 as a strategy to subtract. How can you make a ten to help you subtract? 4.5 Break Apart to Subtract TE pg169A 1.OA.6, CC.1.OA.6 Subtract by breaking apart to make a ten. How do you break apart a number to subtract? 5.2 Hands On – Record Related Facts TE pg 189A 1.OA.6, CC.1.OA.6 Record related facts within 20. How do related facts help you find missing numbers? o related facts • Animated Math Models • iTools • HMH Mega Math MathBoard, red and blue connecting cubes, red and blue crayons, Grab and Go Center: orange activity card 11, Picture Puzzles, Game- Related Fact Race 1 day 5.3 Identify Related Facts TE pg 193A 1.OA.6, CC.1.OA.6 Identify related addition and subtraction facts within 20. How do you know if addition and subtraction facts are related? 5.4 Use Addition to Check Subtraction TE pg 197A 1.OA.6, CC.1.OA.6 Apply the inverse relationship of addition and subtraction. How can you use addition to check subtraction? • Animated Math Models • iTools • HMH Mega Math MathBoard, Grab and Go Center: orange activity card 11, Picture Puzzles, Game- Related Fact Race 1 day 5.5 Hands On – Algebra – Missing Numbers TE pg 201A 1.OA.8, CC.1.OA.8 Use related facts to determine unknown numbers. How can you use a related fact to find a missing number? How can you use a related fact to find a missing number? MathBoard, crayons, Grab and Go Center: purple activity card 18, Juggling, Game- Related Facts Race 1 day 5.7 Choose and Operation TE pg 209A 1.OA.1, CC.1.OA.1 Choose and operation and strategy to solve an addition or subtraction problem. How do you choose when to add and when to subtract to solve a problem? 5.8 Hands On – Algebra – Ways to Make Numbers to 20 TE pg 213A 1.OA.6, CC.1.OA.6 Represent equivalent forms of numbers using sums and differences within 20. How can you add and subtract in different ways to make the same number? • MathBoard, red, blue, and yellow connecting cubes, red and blue crayons, Grab and Go Center: blue activity card 11, purple activity card 16, Game- Basic Facts Race 1 day 5.9 Algebra – Equal and Not Equal TE pg 217A 1.OA.7, CC.1.OA.7 Determine if an equation is true or false. How can you decide if a number sentence is true or false? • MathBoard, crayons, Grab and Go Center: blue activity card 18, Juggling, Game- Basic Facts Race 1 day 5.10 Basic Facts to 20 TE pg 217A 1.OA.6, CC.1.OA.6 Add and subtract facts within 20 and demonstrate fluency for addition and subtraction within 10. How can addition and subtraction strategies help you find sums and differences? 6.1 Count by ones to 120 TE pg 241A 1.NBT.9, CC.1.NBT.9 Count by ones to extend a counting sequence up to 120. How can knowing a counting pattern help you count to 120? 6.6. Hands On -Tens and Ones to 50 TE pg 261A 1NBT.10, CC.1.NBT.10 Group objects to show numbers to 50 as tens and ones. How can you group cubes to show a number as tens and ones? 6.7 Hands On -Tens and Ones to 100 TE pg 265A 1.NBT.10, CC.1.NBT.10 Group objects to show numbers to 100 as tens and ones. How can you show numbers to 100 as tens and ones? 1. hundred • Animated Math Models • iTools: Base-Ten Blocks • HMH Mega Math MathBoard, base-ten blocks, connecting cubes, Counting Tape, Grab-and-Go Centers Kit: purple activity card 14, Strawberries, Games-Tens and Ones Race 1 day 6.8 Problem Solving - Show Numbers in Different Ways TE pg 269A 1.NBT.10a, 1.NBT.11, CC.1NBT.10a, CC.1NBT.11 Solve problems using the strategy make a model. How can making a model help you show a number indifferent ways? 6.10 Hands On - Model, Read, and Write Numbers from 110-120 TE pg 277A 1.NBT.9, CC.1.NBT.9 Read and write numerals to represent a number of 110 to 120 objects. How can you model, read, and write numbers from 110 to 120? 1 day 7.3 Hands On: Algebra - Use symbols to Compare TE pg 297A 1.NBT.11, CC.1.NBT.11 Use symbols for is less than “”, and is equal to “=” to compare numbers. How can you use symbols to show how numbers compare? 7.4 Problem Solving – Compare Numbers TE pg 301A 1.NBT.11, CC.1.NBT.11 Solve problems using the strategy make a model. How can making a model help you compare numbers? Identify numbers that are 10 less or 10 more than a given number. How can you identify numbers that are 10 less or 10 more than a number? 8.4 Use a Hundred Chart to Add TE pg 329A 1.NBT.12, CC.1.NBT.4 Use a hundred chart to find sums. How can you use a hundred chart to count on by ones and tens? • iTools: Number Charts MathBoard, Hundred Chart (see eTeacher resources), Grab and Go Center: blue activity card 20, It’s a Homerun 1 day 8.5 Hands On – Use Models to Add TE pg 333A 1.NBT.12, CC.1.NBT.4 Use concrete models to add ones or tens to a two-digit number. How can models help you add ones or tens to a twodigit number? MathBoard, base-ten blocks, Grab and Go Center: blue activity card 20, It’s a Homerun, Game- Neighborhood Sums 1 day 8.6 Hands On – Make Ten to Add TE pg 337A 1.NBT.12, CC.1.NBT.4 Make a ten to add a two-digit number and a one-digit number? How can making a ten help you add a two-digit number and a one-digit number? 8.7 Hands On – Use Place Value to Add TE pg 341A 1.NBT.12, CC.1.NBT.4 Use tens and ones to add two-digit numbers. How can you model tens and ones to help you add twodigit numbers? 1.NBT.12, CC.1.NBT.4 Solve and explain two-digit addition word problems using the strategy draw a picture. How can drawing a picture help you explain how to solve an addition problem? 9.1 Hands On- Order Length TE pg 369A 1.MD.15, CC.1.MD.1 Order objects by length. How do you order objects by length? 1. longest 2. shortest • HMH Mega Math MathBoard, classroom objects, an assortment of yarn and crayons of different length, Counting Tape, The Dog Show, Grab-and Go Centers Kit: Game- Measure Up! 1 day 9.2 Indirect Measurement TE pg 373A 1.MD.15, CC.1.MD.1 Use the Transitivity Principle to measure indirectly. How can you compare lengths of three objects to put them in order? 9.4 Hands On-Make a Nonstandard Measuring Tool TE pg 381A 1.MD.16, CC.1.MD.2 Make a nonstandard measuring tool to measure length. How do you use a nonstandard measuring tool to measure length? • Animated Math Models • HMH Mega Math MathBoard, different color paper clips of the same size, tape, sturdy paper, Counting Tape, Grab-and Go Centers Kit: Game- Measure Up!, Treasure Hunt 1 day 9.5 Problem Solving TE pg 385A 1.MD.16, CC.1.MD.2 Solve measurement problems using the strategy act it out. How can acting it out help you solve measurement problems? 1.MD.17, CC.1.MD.3 Use the hour hand to draw and write times on analog and digital clocks. How do you know whether to draw and write time to the hour or half hour? 10.1 Read Picture Graphs TE pg 413A 1.MD.18, CC.1.MD.4 Analyze and compare data shown in a picture graph where each symbol represents one. What do the pictures in a picture graph show? 1. picture graph • HMH Mega Math • Animated Math Models • iTools MathBoard, blue and green connecting cubes, Counting Tape, Mrs. B’s Class Makes Tables and Graphs, Graband Go Centers Kit 1 day 10.2 Hands On- Make Picture Graphs TE pg 417A 1.MD.18, CC.1.MD.4 Make a picture graph where each symbol represents one and interpret the information. How do you make a picture graph to answer a question? 10.6 Hands On- Make a Tally Chart TE pg 433A 1.MD.18, CC.1.MD.4 Make a tally chart and interpret the information. Why is a tally chart a good way to show information that you have collected? 10.7 Problem Solving- Represent Data TE pg 437A 1.MD.18, CC.1.MD.4 Solve problem situations using the strategy make a graph. How can showing information in a graph help you solve problems? 11.1 Hands On - Three-Dimensional Shapes TE pg 457A 1.G.19, CC.1.G.19 Identify and describe three-dimensional shapes according to defining attributes. How can you identify and describe three-dimensional shapes? 1. 2. 3. 4. 5. 6. Identify two-dimensional shapes on three-dimensional shapes. What two-dimensional shapes do you see on the flat surfaces of three-dimensional shapes? 12.3 Hands On – Combine Two-Dimensional Shapes TE pg 493A 1.G.20, CC.1.G.2 Use objects to compose new two dimensional shapes. How can you put two dimensional shapes together to make new two-dimensional shapes? • iTools: Base Ten Blocks • HMH Mega Math • Animated Math Models MathBoard, pattern blocks, Grab and Go Center: blue activity card 10, purple activity card 10, Game- On the Water. 1 day 12.4 Combine More Shapes TE pg 497A 1.G.20, CC.1.G.2 Compose a new shape by combining two-dimensional shapes. How can you combine two-dimensional shapes to make new shapes? • HMH Mega Math • Animated Math Models MathBoard, models of two-dimensional shapes, twodimensional shapes (see eteacher resources), Grab and Go Center: purple activity card 10, Game- On the Water 1 day 12.5 Problem Solving – Make New Two-Dimensional Shapes TE pg 501A 1.G.20, CC.1.G.2 Make new shapes from composite two-dimensional shapes using the strategy act it out. How can acting it out help you make new shapes from combined shapes? R.5 Algebra- Subtraction Function Table CC.1.OA.6, CC.2.OA.2 Complete a subtraction function table. How can you follow a rule to complete a subtraction function table? • Animated Math Models MathBoard 1 day R.6 Algebra- Follow the Rule CC.1.OA.6, CC.2.OA.2 Complete addition and subtraction function tables. How can you follow a rule to complete an addition or subtraction function table? • Animated Math Models MathBoard 1 day R.7 Add three numbers CC.1.OA.3, CC.2.OA.2 Choose a strategy to add three numbers. How can you choose a strategy to help add three numbers? • Animated Math Models • HMH Mega Math MathBoard 1 day R.8 Add a one-digit number to a two-digit number CC.1.NBT.4, CC.2.NBT.5 Find the sum of a one-digit number and a two-digit number. How can you find the sum of a one-digit number and a two-digit number? • Animated Math Models • HMH Mega Math MathBoard 1 day R.9 Add two-digit numbers CC.1.NBT.4, CC.2.NBT.5 Find the sum of two 2-digit numbers. How can you find the sum of two 2-digit numbers? R.11 Use repeated addition to solve problems CC.1.OA.6, CC.2.OA.4 Use repeated addition to solve real world problems. How can you use repeated addition to solve real world problems? R.15 Time to the hour and half hour CC.1.MD.3, CC.2.MD.7 Tell and write time to the hour and half hour using an analog clock. How do you tell time to the hour and half hour on an analog clock? • Animated Math Models • HMH Mega Math • iTools MathBoard 1 day R.16 Use a picture graph CC.1.MD.4, CC.2.MD.10 Read and interpret information displayed on a picture graph. How do you read a picture graph? • Animated Math Models • HMH Mega Math MathBoard 1 day R.17 Use a bar graph CC.1.MD.4, CC.2.MD.10 Read and interpret information displayed on a bar graph. How do you read a bar graph? R.19 Identify shapes CC.1.G.1, CC.2.G.1 Use attributes to help identify two-dimensional shapes. How can attributes help you identify shapes? 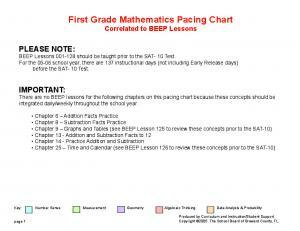 Report "Baldwin County Mathematics Pacing Guide Grade 1"